If you’ve been following our social media accounts lately, you might know that we’ve partnered with Purina ONE® to help them promote the launch of their newest cat food, Tender Selects Blend With Real Chicken and support the Purina ONE® Whole Body Health Project. What is the Whole Body Health Project? Created by Purina ONE expert behaviorists and nutritionists, the Whole Body Health Project provides easy, daily routines you can create with your cat to help promote lifelong health and happiness. One of these routines is determining your cat’s baseline for physical health, appetite, and behavior. 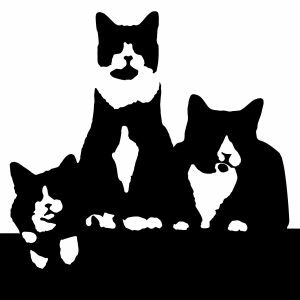 I’ll walk you through the steps of determining your own cat’s baseline and let you know how Ben, Jack, and Hugo measure up. Step 1: Keep an eye on your cat while he is eating. Does he eat quickly or is he a grazer? Does he come running when he hears you put the bowl down? Knowing your cat’s typical eating patterns can help you build smart feeding routines for Whole Body Health. Three-year-old Jack is a grazer. I’ve mentioned before—he is actually our pickiest eater and rarely comes running when he hears food being served. He eats at his own leisure and on his own terms. Two-year-old Hugo, on the other hand, tends to scarf his meals down. He eats quickly and loudly, making sure to circle around the other cats’ food bowls after they are finished to see if they have any leftovers. He is a very healthy weight, though, (around 12 pounds) and gets plenty of exercise during playtime. Despite his bigger size, five-year-old Ben isn’t a super eager eater. He will, however, become very vocal if he believes we have missed his usual dinner time. He knows when he is hungry and will let us know it is time to eat. Ben eats at his own pace and doesn’t always finish his meal, which might come as a surprise to some. He’s bigger than the other cats by several pounds, so we try to keep him engaged and active during playtime. Step 2: Check your cat’s coat. When your cat is healthy, his coat should be shiny and glossy and his skin should feel elastic and hydrated. You can check your cat’s skin by using the “pinch” test: Gently pinch the skin by your cat’s shoulders. If your cat is properly hydrated, his skin should spring back upon release. To promote healthy hydration, make sure your cats have plenty of fresh water each day and try including wet food in their daily diets. Jack’s coat is soft and sleek. He keeps himself very clean after eating meals and using the litter box. His skin is healthy and passes the hydration “pinch” test. Hugo’s coat is silkier than Jack’s, but just as soft. He also passes the “pinch” test. While Ben’s coat is silky, he often struggles with reaching all his parts and in the winter sometimes exhibits dry, flaky skin. We make sure to brush him daily to keep a healthy sheen on his coat and we make an effort to ensure he’s fully hydrated. Ben is also the only one out of the three who loves to play with his water, so we let him have a few minutes alone each day to splash around in the bathtub and drink from the faucet. Step 3: Observe your cat’s play style. Signs of healthy play include the ability to play socially with other pets as well as playing solo. All cats play differently, but knowing your cat’s baseline can help you build smart routines for a lifetime of Whole Body Health. Did you know that establishing a daily playtime routine with your cat encourages healthy physical and mental growth? Jack wins playtime by a landslide. He is by far the most playful cat I have ever known. Not only will he bring his toys right up to us and meow loudly to let us know that he’s ready to play, he will play fetch with you for hours. Sometimes we even catch him playing by himself—tossing the toys up in the air and jumping around to play catch with himself. Jack is very social and loves to play with Hugo, often chasing him back and forth throughout our home to engage in a quick tumble. Hugo is also quite social when he plays. If Jack initiates the game with us, Hugo is quick to join in and loves to play fetch as well. Out of the three cats, I’d have to say Hugo is the most timid, so sometimes it takes a little encouraging to join in, but he gets very excited when I take the feather toy out. He loves to hunt. Sometimes he will catch the feather firmly in his mouth and start walking for the door, as if he needs to take his prey to another room to enjoy it! Because Ben is quite a bit heavier than the other two, he isn’t as active when it comes to playing games. But when Ben gets excited, he can still jump and leap just as high as Jack and Hugo. Ben is less of a social player—he will often sit on the sidelines and watch while Jack and Hugo play, and sometimes we catch him playing solo as well. This is ok—all cats play differently and knowing your cat’s baseline for play is what matters. Understanding your cat’s playing style can keep you alert to any changes that might indicate a potential problem. How often should you reestablish your cat’s baseline? Purina ONE experts suggest you should be monitoring your cat’s daily routine, but you should re-check your cat’s baseline at major milestones in his life, such as during kittenhood (or at adoption time), after spaying or neutering, when he enters adulthood, and during his senior years. I hope these steps have allowed you to establish your own cat’s baseline and help you better understand your cat’s personality and needs. It’s so important to pay attention to what our feline friends are trying to tell us each day in their own ways. Knowing your cat’s baseline and personality type helps bring you closer to your cat and establishes a healthy, happy relationship that you can depend on for your cat’s lifetime. To learn more about how you can create healthy routines for your own cat, visit www.purinaone.com/cats/whole-body-health.